Our Italian variety pear, Moretini, has come into season. The season is short, we will only have them till the middle of August! They are creamy like a Bartlett and juicy like a Comice. Come by the stand and ask for a sample! It will melt and tingle your taste buds! In the mood to baking a fresh pie? Here's a recipe that is super simple! Here is a very easy pie recipe that we tried out this week! You can make your own pie crust but if you are itching for time, we found that the pre-made dough pie crust from Pillsbury seemed to worked the best! Also, we used a super deep pie dish as well as stuffing this pie really thick. If you find that you have left overs of the fillings...put into a separate baking dish and bake along side with the pie. You can use the extra filling to put over vanilla ice cream! Prepare the filling by cutting the peaches into big chunks, then into a large mixing bowl. Add blueberries, sugar, flour, butter, and lemon juice. Mix together and set aside. For the crust, roll out the two rolls of the pie crust to the width of your pie dish with an overlap. Lay the first layer of the crust into you 9-inch pan. Pour the filling to your desired density. Then cover the with the 2nd pie crust. Roll up and crimp sides to seal in the filling. Vent top of pie crust with a fork in a few spots. Cover with foil and bake for one hour. Then uncover to bake for another 45min to an hour. Remove and let it cool to room temperature. Serves 8-10... or in our case, my husband ate whole thing! Well, it was a very short season for cherries this year! 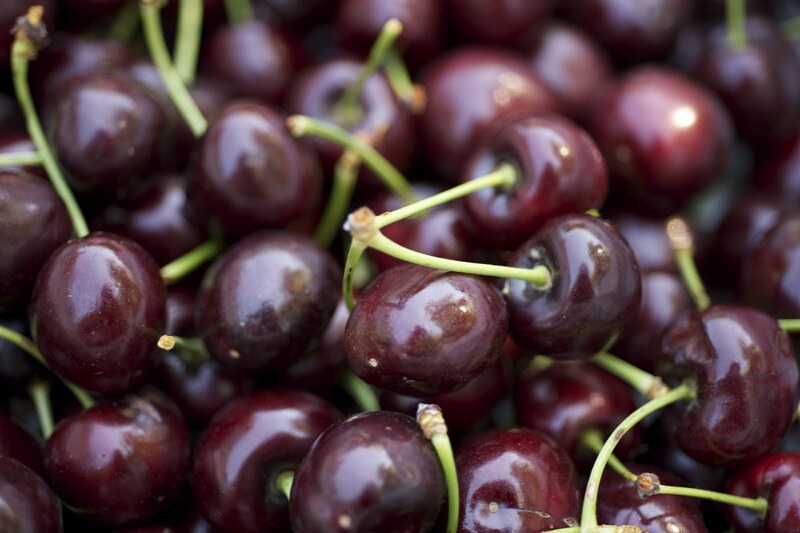 With the late rain in May, the cherries were damaged and we lost about 80% of the crop due to cracked cherries. Usually our season can last from May-July but we had to cut it short. Here's a photo of the last batch of cherries we picked on the 1st of July. Look forward to them next May 2012! Sweet & Juicy Bing Cherries!